...Some say he dreams about new puzzles and when he wakes up in the morning there’s a working prototype in his workshop. ...Some say he can fix broken puzzles by the power of thought alone and that he once suggested that Stewart Coffin look into using rhombic dodecahedrons. All we know is, he’s called the Stick (man)! With thanks and apologies to Top Gear. it’s an incredible mechanical achievement. Rob teased us with some pics of his latest work-in-progress on the Renegade Puzzlers Forum back in February and it’s probably fair to say that it created a fair amount of interest. He showed us pictures of a half completed framework with all manner of interesting-looking gears, screws and gadgets – and a chain, made of wood(!). Roll forward a couple of months and I’d taken Rob up on his offer of a puzzle and been tracking it’s progress from Oklahoma to Barnt Green ... en route it was intercepted by Her Majesty’s Revenue and Customs who duly sent me a ransom demand (or VAT invoice if you prefer) a few days ago. Yesterday I managed to get up to the Parcel Force depot to pay the ransom and get my package released ... and then I had an absolutely brilliant time exploring Rob’s latest masterpiece. For starters, this isn’t a small puzzle – the basic premise is that you need to solve the puzzle in order to open the framework that cocoons (read: securely locks in place!) 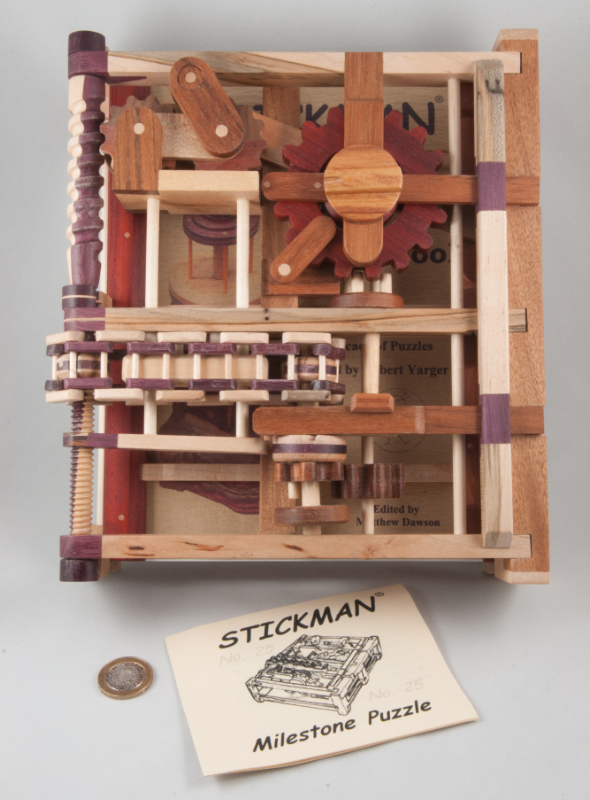 the commemorative Stickman Milestone Puzzle Book inside. The cover of the framework has the most amazing set of interconnected mechanics I’ve ever seen: the left hand side has a drive shaft with two different sorts of screw thread – one of which in turn drives a set of helical gears and the other, via a couple of sprockets, drives a chain to transfer the movement to a secondary shaft in the centre ... but the more that you examine the mechanism, the more it perplexes. There are a couple of bits that appear to be driven at different speeds by that drive shaft – except they’re quite firmly connected ... most of the gears and other bits have a little bit of play in them, but for quite a while, I couldn’t work out what was stopping them all from moving – I could see that they were interconnected, and thanks to the open nature of the framework, you can see almost everything. I’d poked and prodded for a while before I started investigating a bit more widely and then stumbled across what I’d been missing up to now and all of a sudden a whole new world of opportunities opened up to me and I had my first opportunity to exercise the mechanics of this beauty – and it is absolutely mesmerising watching the various gears and sliders interacting to produce some rather unusual moments in the one half, while that chain drives the secondary shaft in the other half – the mechanics are staggering – how the heck they were first conceived is well beyond me, but the skills required to implement them are truly mind-blowing. Playing with the mechanics is fun and can be a little instructive as things that were hidden at the start make their appearance and you wonder to yourself if that might just be useful later on – I found myself trying little experiments to try and isolate bits of the machine so that I could improve my understanding of how they were all interconnected – or not – and what was actually stopping the frame from opening, and then working back to what was stopping that from happening and so on – it must have taken the best part of an hour to work out the basic gist of the machine and then start actually trying to unlock it, and a few times I came close, but not quite close enough – until I spotted something else I’d been missing all along, and that was the final little piece in the jigsaw – although executing it all still took a while, but eventually I had released the catches and opened the frame to allow the book to be released. 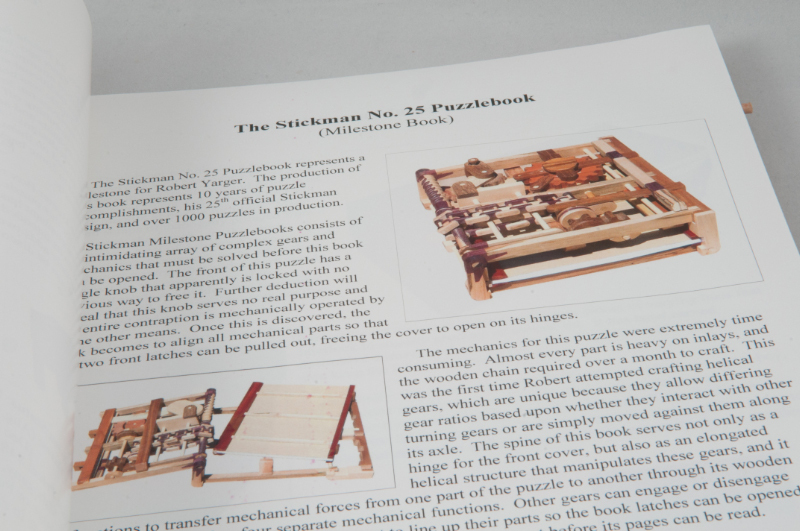 Well, not quite – actually the book itself is a puzzle too! 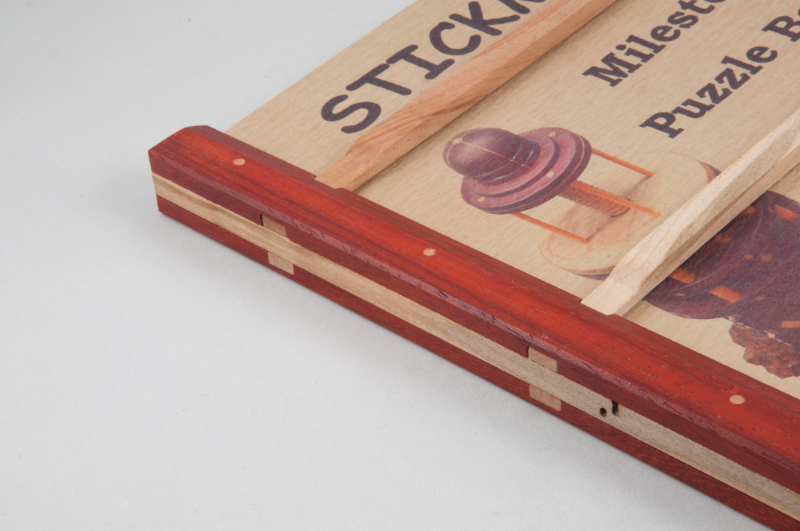 The spine is beautifully crafted in wood (what else, right?) and has three arms locked into it that cover the front and the back – and they are in turn joined on the right hand side by a pair of cross-pieces that are pegged together ... and it took me another little while to force myself to think of this as yet another Stickman Puzzle – after which I managed to work out how to get into it... and there is treasure within the book. Rob and Matt Dawson have pulled together a lovely book giving the background to Rob’s journey from hobbyist to puzzle-making rock star (my phrase – I think Rob’s far too humble to refer to himself that way). 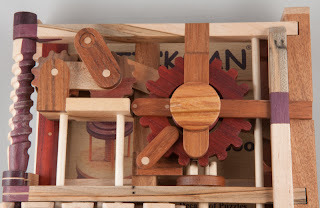 It was really interesting to read about how Rob started out making puzzle boxes with a single radial-arm saw (a.k.a. widow-maker) and how he still chooses to use it for all sorts of strange, unintended jobs today. It was nice to read about his early collaboration with Eric Fuller and their Camelot period (great description, by the way!) and to get Rob’s perspective on how he designs his puzzles. One thing that really attracted me to Rob’s puzzles was the fact that they’re all so totally different from one another – it’s hard to look at one of them and see a family resemblance to any of the other puzzles he’s produced – apart from the style of the work, perhaps – so it was interesting to read that Rob has always actively avoided making anything that looks like anything else already out there in puzzle-dom, and that sort of explains it all – his work really is unique. The second part of the book contains descriptions and pictures of every Stickman Puzzle produced to date (and even obscures the details of his Apothecary Chest drawer so as not to spoil it for any of the other participants!) 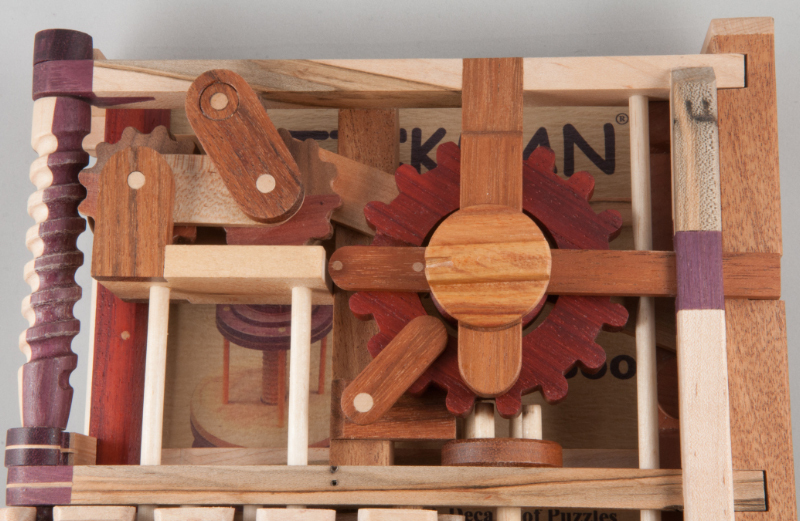 including details of the production runs and even a set of high level solutions to every puzzle. After that there’s a section on some of the prototypes or ideas that haven’t quite made it out into the wild yet ... all of which shows that having reached these milestones 10/25/1000 there’s still a lot left in the tank! Here’s hoping that Robert Yarger, aka Stickman, will carry on adding beautifully crafted highly original puzzles to this list for ages to come. Thank you Rob – truly a Milestone Puzzle to celebrate and enjoy! I would also like just the book if it was available! Oooh, you can't compare the work of Stickman to that of Stewart Coffin. No puzzle artist (even Robert)can hold a candle to the contribution of Coffin. 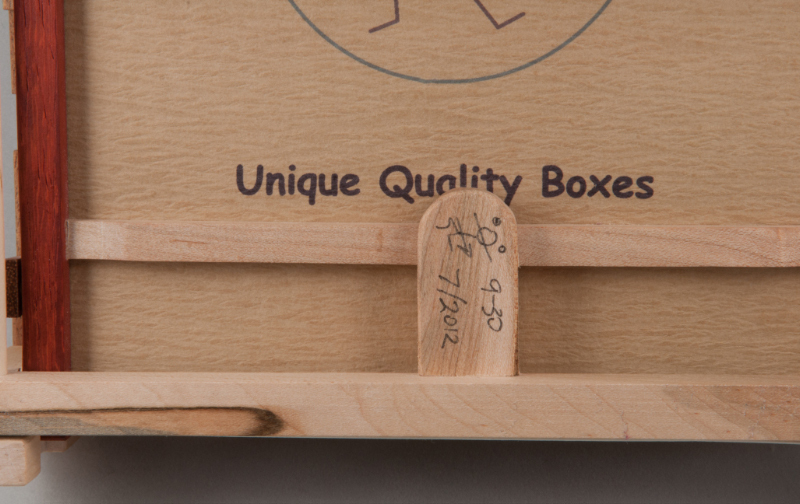 Every puzzle artist to date owes thier inspiration directly or indircetly to Coffin, and it can not be the other way around. 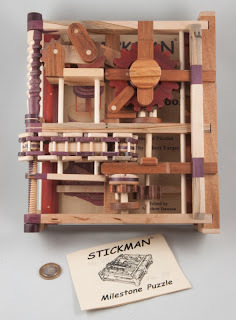 With that being said, Allard is spot on, as this was a very nice puzzle and crafted in response to not only Matt Dawson's pestering for an official puzzle book, but also to many collectors who wanted a more mechaical style puzzle. 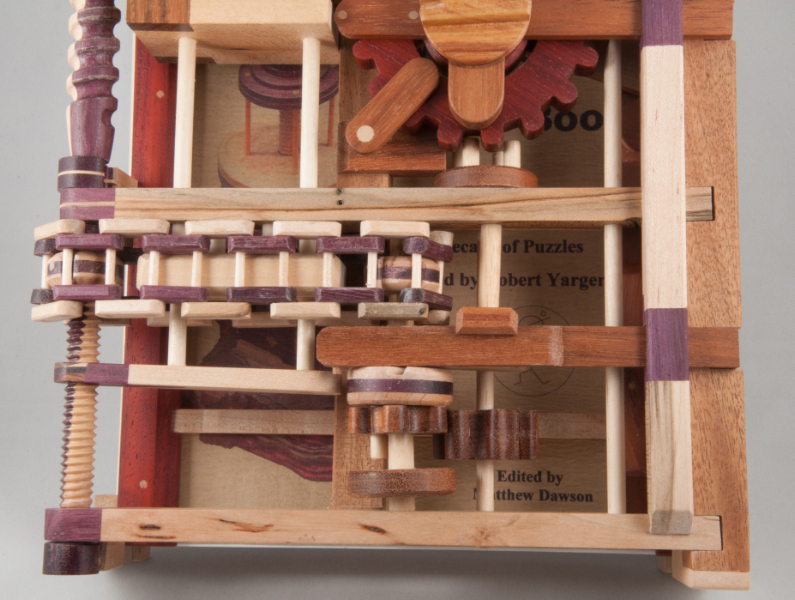 For those wanting a copy of the book in the "simple" 5 move puzzle cage, Robert is working on making around 80 of them now for a very reasonable price. I also think that Allard has perhaps yet to discover the last bit of the puzzle, for there is a hidden puzzle/cypher in the text of the book. Have fun with that. ...now confirmed... Cute extra little twist in there Rob! Just the right level of clue too! A very reasonable price considering the work and detail employed in this puzzle. ...I thought so too - and it is a Milestone in every sense - 'nuff said. 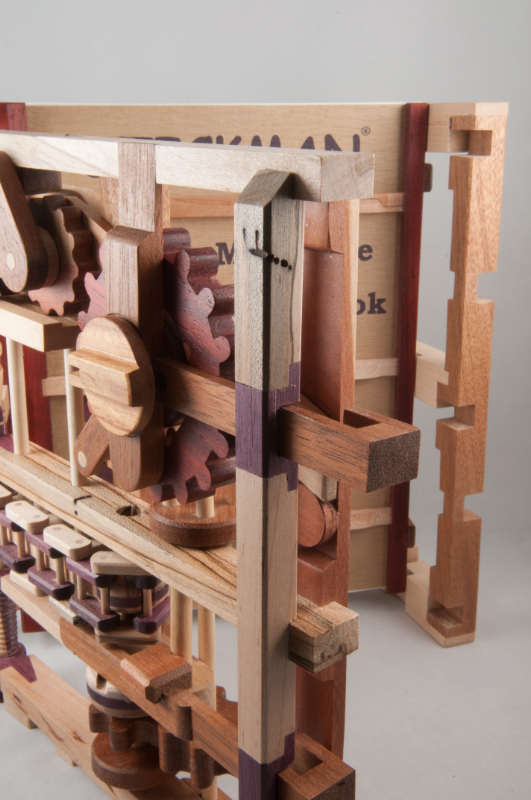 Porsche, Ferrari, pinball machines and now this puzzle is a new dream machine. Good grief Robert, well, I will just continue to dream about it! !